Here's wishing everyone a joyous and prosperous first New Year of the 21st Century. At the December 7th Membership Roundup luncheon, portraits of industry success were painted by top-level executives participating on the Independent Oil Management panel. Discussed were how their acquisition, exploitation and operational strategies have resulted in company growth and increased profits. Emphasized was the importance of finding new reserves using 3D geologic modeling and visualization to discover new faults and new areas for prospects. And, introduced was the DOGGR electronic communication system for oil and gas operators to expedite processing of permits. The executives stressed the importance of improving community relations to enhance opportunities to receive government approval for development and production of oil field properties. In the Los Angeles Basin, our future profitability involves more than traditional technical and financial issues, as community relations continue to play a significant role. This is the 6th year that LASPE has sponsored Community Outreach programs. To celebrate, a skit was presented by Outreach Chair, Ed Santiago, and five 5th Grade students from the International Elementary School of Long Beach (see photo). The skit was a representation of the Essay and Art Poster program presented to schools. In this program, students write stories and create art work that depict the benefits of petroleum in their daily lives. 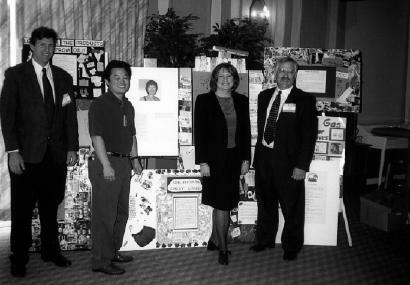 The student posters displayed at the luncheon were previously on display at their schools and the city of Long Beach Public Library (see photo). The International Elementary School Principal, Ms. Jonette Newton, spoke about the importance of the SPE Community Outreach program to their students and teachers and she encouraged further involvement of working partnerships between industry and education. Scholarship Chair, John Jepson, awarded the SPE scholarships which totaled $8,500 to eleven students participating in petroleum engineering programs at USC and CSULB (see photo). The winners of these scholarships were determined based on scholastic achievement, SPE involvement, volunteerism and industry experience. The USC scholarship winners under Dr. Iraj Ershaghi were: Ali Fakhari, Sally Morton, Frank Fernandez, Mohammad Haroun, Pouya Amili and Jose Arias. The CSULB scholarship winners under Dr. Jalal Torabzadeh were: Montserat Martin, Jason McEntire, Sean Bao Vuu, Rebecca Williams and Hoang P. Dinh. Photos of scholarship winners are shown inside the newsletter. Let me thank our Board members, the Petroleum Technology Forum and the West Coast PTTC for their contributions to the Membership Roundup luncheon. With over 90 people attending, we are starting off the new millennium in great style. Thank you. 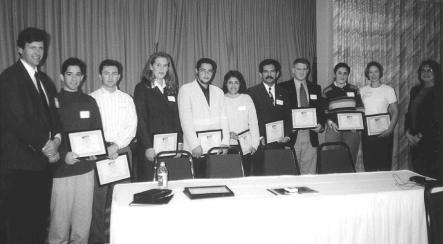 Our June, 2000 combined SPE/AAPG Meeting remains on the right track! A combined SPE/AAPG committee meeting held December 9th in Long Beach resulted in refocused priorities as well as improved networking between the two groups. Major contracts are in place, exhibit sales are ahead of schedule, and technical program details are firming up as abstracts poured in around the December 10th deadline. Lots of work remains, so please consider contributing your time and/or abilities to help make this meeting a success - less than six months remain between now and this historic meeting! Contact Glenn Swanson at 310/ 979-4777 ext. 11 to volunteer or for additional information. The first round of Opportunity to Exhibit letters have generated a strong positive response. We anticipate exhibit space to sell out by mid January. All exhibitors who commit to booth space by January 15th will be listed in the Announcements brochure. Reserve space by contacting Linda Smith at (310) 395-0185. Downtown L.A. Bank seeks Petroleum Engineer with 0 to 5 years experience. Provide technical support for loans made to small, independent oil and gas companies. Bank experience not required, but must be proficient with Lotus or Excel. Salary range $40,000 to 60,000 plus benefits. Please fax resume to F. Arroyo at Union Bank of California (213) 236-6483. Abstract:	Tremendous change is occurring in California's oil and gas producer community. Find out how industry consolidation, state/federal legislative and regulatory initiatives and oil & gas price projections will forever alter the petroleum industry in California. Biography:	Daniel P. Kramer has worked for the California Independent Petroleum Association (CIPA) since April 1991. 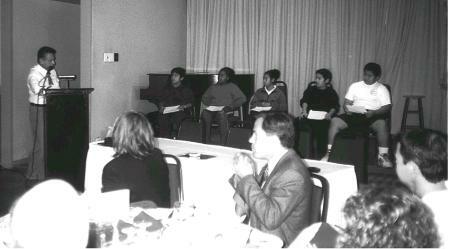 He was promoted to Executive Director, his current post, in January 1993. CIPA is a statewide trade association representing 450 independent oil and natural gas producers, service and supply companies operating in California. Dan recommends and implements policy for CIPA's 50 member Board of Directors. He services as chief spokesperson for CIPA and coordinates all of its state and national legislative activities. He frequently testifies before Congress, the California State Legislature and in various state/local/federal regulatory and administrative forums. Prior to joining CIPA, Dan worked for the California State Legislature in various capacities. Dan is a graduate of the University of Southern California with a BA in Political Science and a Masters Degree in Public Administration. Programs at USC and CSULB. students from the International Elementary School of Long Beach.